Metro station line No. 6. Identical reconstruction of the staircases giving access to the wharfs. What were the challenges encountered that contributed to the project's success? from the end of May to mid-July 2017: studies using the surveyor's statement. demolition of the existing structure, manufacture, assembly of the new structure, and opening to the public on August 28, 2017.
strict regulation on the stairs and guard rails to be adhered to: precision of the step height to the millimeter, while the existing environment had imperfections of several centimeters. Model including all of the principal plots: existing environment, metal structure, concrete flooring in prefabricated slabs (to gain work time), steps, locksmithing, skylights, windows, etc. 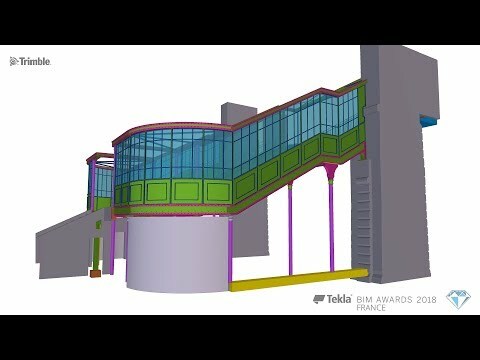 What benefits did BIM and Tekla Structures provide to you? Using the 3D surveyor's statement, the use of the Trimble RealWorks Viewer software to determine the coordinates of the existing structure. Importation of the reference points from the existing structure into the Tekla model (gain of time/exact installation of the existing structure). concrete and wood reinforcements of the existing structure. Using Tekla Structures, creation of 3D plans and outflow in IFC and PDF-3D for viewing on Tekla BIMSight, Adobe Reader, and other 3D viewers for validation. Due to the short deadlines, several manufacturing sites worked based on the plots. Thanks to Tekla Structures, we broke down the project into several slices based on the planning and manufacturing sites. Tracking (flows and assemblies) and reinforcements were done on Tekla Structures. The assembly plans (work shop assembly and work site assembly) were done on Tekla Structures.